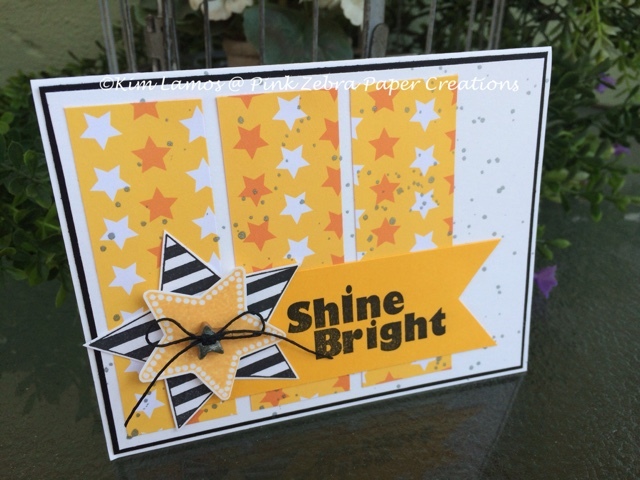 Pink Zebra Paper Creations: Shine Bright! Today's card is a result of some research and positive affirmations I have been looking into. Sometimes we need some encouragement along the way. First, cut the base and layers from Whip Cream and Black Licorice Cardstock. Then cut three strips of Journey Basic Brights Pattern paper on the left side of the card. Then, splatter some Silver Silk over the top of the card. Next, cut a piece of Summer Days Cardstock, stamp the "Shine Bright" from the Star Bright stamp set on this piece using Black Licorice Ink and attach to the card. Then stamp the stars with Black Licorice and Orange Creamcicle Ink on Whip Cream Cardstock. I fussy cut these and placed them on the card with pop ups. I finished the card off by coloring the wooden star button with Silver Silk , threaded Black Licorice Journey Twine, tie a bow and attach the button to the card. Enjoy!